Aunt Flora’s is a soul food restaurant that used to be housed in Findlay Market. The owner recently moved the restaurant into a former Chinese restaurant in Silverton. While the décor inside is still calling back to the building’s Chinese roots, the food is all southern soul. The place was not very big on the inside, and not very crowded. There was a small staff of about three young people running the place. Flora herself emerged from the back a few times and greeted our table. Despite the unusual decor the place felt very homey and warm. Our waitress was attentive and informative. She made small talk with us and encouraged us through the menu. The menu was a little sparse, offering mostly chicken wings and fish. They also have daily specials. 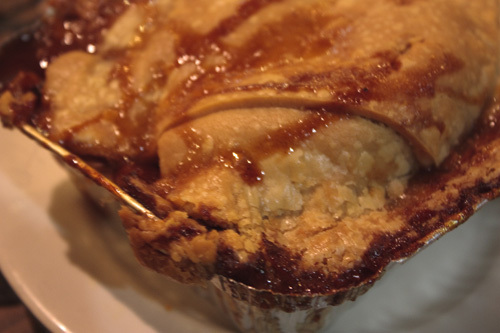 The whole back of the menu is dedicated to cobblers, including sweet and savory versions. 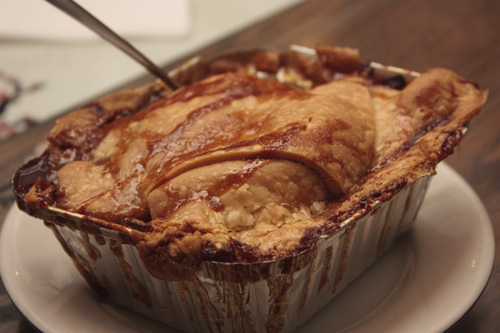 I was not familiar with savory cobblers, and was told that those are cobblers that have vegetables or meat in them. I was curious but they did not have any to sample at the time. Despite the limited options I really only came for fish and chicken so the place met my needs. 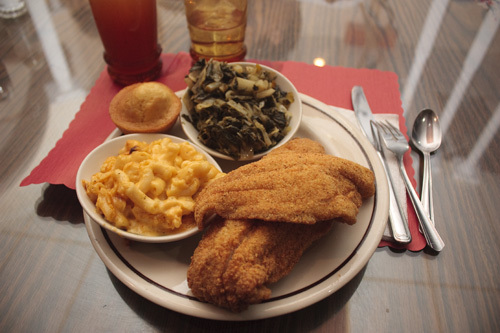 I got the Catfish dinner with mac & cheese and greens. My wife got the chicken with the same. The meals came with cornbread. We also ordered a tin of cobbler for the both of us to share. The food was awesome! 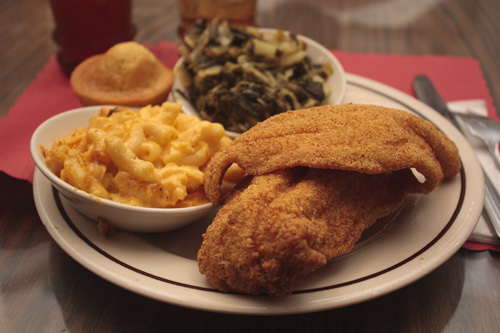 The catfish was breaded just right and fried to golden perfection. Each bite gave me fluffy bits of fish and cornmeal that was dynamite on my tongue. I enjoyed every morsel I ate. The mac & cheese was to die for. It was rich and creamy and delectable with each cheesy bite. My wife and I both agreed it was among the best we had tasted. The greens were a little odd because they had cabbage mixed in, but the flavor was also on point. It was well seasoned and cooked just right so that the flavor wasn’t too bitter but savory instead. Everyone in our party was very pleased by the food. When the cobbler came out it was gorgeous. The waitress had warmed it in the oven so that it had steam rising from the crispy crust. Unlike many cobblers I have had that taste canned and processed this tasted amazing. The crust and filling were scrumptious. The peaches were very rich but delicious. I had to stop myself because I was full from the dinner but I heated some cobbler up later when we were home and it was almost just as good as when we ate it after dinner. The food was great. The décor and the place were a little unusual but I felt very at home in the place. Talking with Flora after the meal she said that many people complain about the food prices and the setting. I had no complaints about either of those things. Some of the best soul food I have ever eaten came from a pick up window, a food truck, or a random grill in a parking lot. The prices were no worse than a Panera or Perkins, but the food was way better. I highly recommend the place and I know I am going back soon.